Ondrej Proksa, Eduard Fritscher: Data Journalism Google Award for Young Talents. 2014. Mária Bieliková, Marián Šimko, Michal Barla, Pavel Michlík, Martin Labaj, Vladimír Mihál, Maroš Unčík, Jakub Ševcech: project ALEF – Adaptive Learning Framework. ICETA 2010 E-learning Competition, 1st place in the category Supporting learning materials. Special prize of the Minister of education for the project with remarkable contribution to education. Michal Tvarožek: Personalized Semantic Web Exploration Based on Adaptive Faceted Browsing. Among the Winners of the 2010 Student Research Competition Grand Finals: 2nd Place. Peter Bartalos: Semantic Web Service Composition Framework Based on Parallel Processing. Web Services Challenge. 2009. Category Architecture: 1st Place. Peter Bartalos: Semantic Web Service Composition Framework Based on Parallel Processing. Web Services Challenge. 2009. Category Performance: 3rd Place. Michal Tvarožek: Personalized Semantic Web Exploration Based on Adaptive Faceted Browsing. ACM Student Research Competition at Hypertext 2009: 2nd Place. Michal Tvarožek: Personalized Navigation in the Semantic Web. Werner von Siemens Excellence Award for Diploma Thesis. 2007. Marián Šimko, Michal Barla, Vladimír Mihál, Maroš Unčík, Mária Bieliková: Supporting Collaborative Web-based Education via Annotations. Outstanding Paper Award at ED-MEDIA 2011. Michal Barla and Mária Bieliková: Ordinary Web Pages as a Source for Metadata Acquisition for Open Corpus User Modeling. Outstanding Paper Award at WWW/Internet 2010. Pavel Michlík and Mária Bieliková: Exercises Recommending for Limited Time Learning. Best Paper Award at RecSysTEL 2010. Mária Bieliková and Peter Nagy: Considering Human Memory Aspects for Adaptation and Its Realization in AHA! Best Paper Award at the EC-TEL 2006 – Technology Enhanced Learning. Jakub Adam, Monika Filipčíková, Jakub Švec, Filip Vozár: moderateIT. Online Category 2015, Slovak Student Startup Cup 2016. Peter Demčák, Ondrej Galbavý, Miroslav Šimek, Veronika Štrbáková: Speakle. World Citizenship category. World Finals 2013, St. Petersburg. Ľuboš Demovič, Martin Konôpka, Marek Láni, Matúš Tomlein: OwNet. Software Design category. World Finals 2012, Sydney. Anton Benčič, Roman Mészároš, Roman Panneka, Márius Šajgalík: Present. Software Design category. World Finals 2010, Warsaw. Martin Labaj, Peter Líška, Michal Lohnický, Daniel Švoňava: Aid AutoMagically. Software Design category. World Finals 2009, Egypt. Marián Honsch, Michal Kompan, Jakub Šimko, Dušan Zeleník: Energy Consumption Manager. Software Design category. World Finals 2008, Paris. Second Place. Marko Divéky, Peter Jurnečka, Rudolf Kajan, Ľuboš Omelina: S.M.I.L.E. – Smart Multipurpose Learning Environment. Software Design category. World Finals 2007, Seoul. Jakub Mačina: Recommendation of New Questions in Online Student Communities. IT SPY 2017 – Student Project of the Year Czech and Slovak Competition: 2nd place. Ivan Srba: Encouragement of Collaborative Learning Based on Dynamic Groups. ACM SPY 2012 – Student Project of the Year Czech and Slovak Competition: 5th place. Pavol Bielik: Personalized Training Plan Recommendation and Activity Tracking for a Healthier Lifestyle. ACM SPY 2011 – Student Project of the Year Czech and Slovak Competition: 1st place, bachelor theses category. Martin Labaj: Implicit Feedback Based Recommendation and Collaboration. ACM SPY 2011 – Student Project of the Year Czech and Slovak Competition: 4th place, diploma theses category. Karol Rástočný: Adaptive Views as a Mean for Exploratory Semantic Search. ACM SPY 2011 – Student Project of the Year Czech and Slovak Competition: 5th place, diploma theses category. Maroš Unčík: Annotating texts in an educational system. ACM SPY 2010 – Student Project of the Year Czech and Slovak Competition: 2nd place, bachelor theses category. Jakub Šimko: Personalized exploration of the Semantic Web. ACM SPY 2010 – Student Project of the Year Czech and Slovak Competition: 3rd place, diploma theses category. Michal Holub: Website navigation adaptation based on behavior of users. ACM SPY 2010 – Student Project of the Year Czech and Slovak Competition: 5th place, diploma theses category. Marián Šimko: E-Course Authoring: Method for Automated Metadata Generation. ACM CZ Student Research Competition 2008. 3rd Place. Michal Tvarožek: Personalized Navigation in the Semantic Web. ACM CZ Student Research Competition 2006. 2nd Place. Michal Barla: Interception of User’s Interests on the Web. ACM CZ Student Research Competition 2006. 5th Place. Róbert Móro: Personalized Text Summarization. IAB 2012 Best Thesis Competition. 3rd place. Jakub Ševcech: Annotation of Web Pages. IAB 2011 Best Thesis Competition. 3rd place. Marián Hönsch: Virtual Community Detection in Open Information Spaces on the Web. Diploma thesis of the year 2011: 2nd place. Michal Kompan: Personalized recommendation of interesting texts. Diploma thesis of the year 2010: 1st place, category CRM Systems. Tomáš Kramár: Supporting user navigation using social network context. Diploma thesis of the year 2010: 2nd place, category CRM Systems. Dušan Zeleník: Relationships discovery and dynamic groups creation. Diploma thesis of the year 2010: 2nd place, category Computing. Marko Divéky: Generating Dynamic Interactive Stories. Diploma thesis of the year 2009: 3rd place, category Computing. Branislav Pecher, Bachelor Study, 2017. Michal Hucko, Bachelor Study, 2017. Tomáš Chovaňák, Master Study, 2017. Ivan Srba, Doctoral Study, 2016. Peter Gašpar, Master study, 2016. Jakub Šimko, Doctoral Study, 2013. Marián Šimko, Doctoral Study, 2012. Michal Tvarožek, Doctoral Study, 2011. Branisla Pecher: The best student of bachelor study for the academic year 2016/17. Tomáš Chovaňák: The best student of master study for the academic year 2016/17. Veronika Gondová: The best student of the first year master study for the academic year 2016/17. Peter Gašpar: The best student of doctoral study for the academic year 2016/17. Ondrej Kaššák: The best student of doctoral study for the academic year 2015/16. Tomáš Chovaňák: The best student of master study for the academic year 2015/16. Ivan Srba: The best student of doctoral study for the academic year 2014/15. Ivan Srba: The best student of doctoral study for the academic year 2013/14. Ivan Srba: The best student of doctoral study for the academic year 2012/13. Ivan Srba: The best student of master study for the academic year 2011/12. Jakub Šimko: One of the best students of doctoral study for the academic year 2011/12. Ivan Srba: The best student of master study for the academic year 2010/11. Pavol Bielik: The best student of bachelor study for the academic year 2010/11. Marián Šimko: The best student of doctoral study for the academic year 2009/10. Martin Labaj: The best student of master study for the academic year 2009/10. 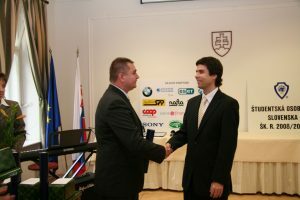 Róber Móro: The best student of bachelor study for the academic year 2009/10. Marián Šimko: The best student of doctoral study for the academic year 2008/09. Martin Labaj: The best student of bachelor study for the academic year 2008/09. Michal Tvarožek: The best student of doctoral study for the academic year 2007/08. Lukáš Marták: Modelling music structure using artificial neural networks. 2017. Martin Konôpka. Software Metrics based on Acitvity of Programmers and Software Development Context. 2017. Peter Dubec: Towards quantitative eye tracking user studies of mobile applications. 2017. Peter Gašpar: Linking Multimedia Metadata by Using Microblogging Network. 2016. Ondrej Kaššák: Group Recommendation for Smart TV. 2014. Róbert Móro: Personalized Text Summarization. 2012. Ivan Srba: Encouragement of Collaborative Learning Based on Dynamic Groups. 2012. Martin Labaj: Recommendation and Collaboration through Implicit Feedback. 2011. Jakub Šimko: Personalized exploration of the Semantic Web. 2010. Michal Holub: Website navigation adaptation based on behavior of users. 2010. Marko Divéky: Dynamic generation of interactive stories. 2009. Marián Šimko: E-Course Authoring: Method for Automated Metadata Generation. 2008. Michal Šimún: Personalized Approach to the User in the E-learning Environment. 2008. Michal Tvarožek: Personalized Navigation in the Semantic Web. 2007. Michal Barla: Capturing user’s Interests on the Web. 2007. Peter Nagy: Adaptation of Presented Information Sequences in Electronic Courses Considering Human Memory Aspects. 2006. Michal Kováčik: Innovative Application Within an International Competition. 2017. Veronika Gondová: Support of student’s activity in an e-learning system. 2016. Jakub Mačina: Innovative Application Within an International Competition. 2015. Martin Tamajka: Innovative Application for International Competition. 2014. Miroslav Šimek: Innovative Application for International Competition – Speekle. 2013. Martin Konôpka: Innovative Application for International Competition – OwNet. 2012. Pavol Bielik: Innovative Application for International Competition – Move2Play. 2011. Jakub Ševcech: Automatic Web Content Annotation. 2011. Ivan Srba: Tracing Strength of Relationships between Users in Social Networks. 2010. Martin Labaj: Software Design in Imagine Cup Competition – Present. 2009. Michal Šimún: The Rules for the User Model Adaptations. 2006. Matúš Pikuliak: Ontology learning from the Web. 2016. Peter Demčák: Methodics of game evaluation based on implicit feedback. 2015. Peter Dulačka: Music Metadata Validation via Game with a Purpose. 2014. Jakub Ševcech: Web Navigation Based on Annotations. 2013. Anton Benčič: Context-based Recommendation in Specific Domain. 2012. Marián Hönsch: Virtual Community Detection in Open Information Spaces on the Web. 2011. Karol Rástočný: Navigation on the Semantic Web Employing Adaptive Views. 2011. Tomáš Kramár: Supporting user navigation using social network context. 2010. Michal Kompan: Personalized recommendation of interesting texts. 2010. Marek Tomša: Adaptive Navigation Support in Open Spaces. 2008. Andrej Krištofič: Discovery of Knowledge about Student’s Behavior during Process of Learning Programming. 2005. Adam Lieskovský: Personalized scalable recommendation system. 2016. Jaroslav Loebl: Automatic text processing – syntactic analysis of a sentence. 2016. Róbert Horváth: Augmenting the Web for Facilitating Learning. 2013. Peter Krátky: User Modeling Using Social and Game Principles. 2013. Peter Macko: Unified Search of Linked Data on the Web. 2013. Petra Vrablecová: Relationship Discovery from Educational Content. 2013. Peter Kajan: Discovering Keyword Relations. 2012. Eduard Kuric: Automatic Photo Annotation Based on Visual Content Analysis. 2011. Martin Jačala: Relation Search in Unstructured Text by means of Semantic Analysis. 2011. Pavel Michlík: Solved exercises in adaptive educational web-based system. 2010. Dušan Zeleník: Relationships discovery and dynamic groups creation. 2010. Richard Veselý: Ontology Representation and Querying Using Relation Model. 2008. Oto Vozár: Web Learning System Adaptation based on Continuous Assessment. 2008. Katarína Matušíková: Personalized Navigation in Information Space. Dean’s honourable mention 2005. Ladislav Gallay: Automatic computation of textual similarity. 2016. Peter Demčák: Innovative Application for International Competition – Speekle. 2013. Matej Marcoňák: Querying Big Data. 2013. Adrián Rakovský: Web browsing based on graph visualization. 2009. Tomáš Kramár: Mining web sites usage patterns. 2008. Matúš Pikuliak: Transfer Learning between Languages for Sentiment Analysis. Doctoral category. 2017. Mária Dragúňová: Considering Human Visual Search Abilities in Eye Tracking User Studies. Bachelor category. 2016. Jakub Gedera: Automatic Diacritics Reconstruction in Slovak Texts. Bachelor category. 2015. Ondrej Kaššák: Students’ BehaviourAnalysis in e-Learning System. Doctoral category. 2015. Peter Dulačka: Validation of Music Metadata via Game with a Purpose. Bachelor category. 2012. Jakub Ševcech: Automatic Web Content Annotation. Bachelor category. 2011. Jozef Tvarožek. Socially Intelligent Approach to E-Learning. Doctoral category. 2010. Ivan Srba. Tracing Strength of Relationships in Social Networks. Bachelor category. 2010. Marián Šimko: E-Course Authoring: Method for Automated Metadata Generation. Master category. 2008. Michal Tvarožek: Adaptive Faceted Browser for Navigation in Open Information Spaces. Doctoral category. 2007. Michal Tvarožek: Personalized Navigation in the Semantic Web. Master category. 2006. Jakub Mačina: Recommendation of New Questions in Online Student Communities. 2017. Adrián Huňa: Automatic Answering of Students’ Questions by Using an Archive of Questions. 2017. Ondrej Kaššák: User Model Specialized for Session Exit Intent Prediction Task. 2016. Peter Demčák: EvaluatingLearnabilityof Games. 2015. Ondrej Kaššák: Weighted Vector User Model for Movie Recommendation. 2014. Martin Konôpka: Identifying Hidden Source Code Dependencies from Developer’s Activity. 2014. Peter Krátky: What Makes the Best Computer Game? How Game Features Affect Game Play. 2013. Karol Rástočný: Usability of Anchoring Algorithms for Source Code. 2013. Jakub Ševcech: Related Documents Search Using User Created Annotations. 2013. Ľuboš Demovič, Martin Konôpka, Marek Láni a Matúš Tomlein: Enhancing Web Surfing Experience in Conditions of Slow and Intermittent Internet Connection. 2012. Peter Korenek: Emotion Classification of Microblogs Based on Appraisal Theory. 2012. Michal Kompan: Exploring Group Recommendation for Single-User Recommendation Tasks. 2012. Pavol Bielik, Peter Krátky, Štefan Mitrík, Michal Tomlein: Motivating Children to Increase Physical Activity by Means of Reward. 2011. Tomáš Kramár: Detecting Search Sessions Using Document Metadata and Implicit Feedback. 2011. Marián Šimko, Michal Barla, Pavel Michlík, Martin Labaj, Vladimír Mihál, Maroš Unčík: ALEF: Learning and Collaboration in Web 2.0. 2010. Peter Bartalos. Scaling QoS Aware Semantic Web Service Composition. 2010. Michal Barla: On Finding Keyword Relations Using Wisdom of the Crowd. 2009. Martin Jačala: Identifying Entity Relationships in News Reports. 2009. Richard Veselý: Ontology Representation and Querying Using Relational Model. 2008. Ján Suchal: Caching Spreading Activation Search. 2007. Peter Bartalos: An Approach to Object-Ontology Mapping. 2007. Michal Barla: Interception of User’s Interests on the Web. 2006. Michal Kováčik, Jozef Mláka, Pavol Ondrejka, Branislav Pecher: OCR and Analysis of Receipts at the Level of Individual Items. 2017. Peter Demčák, Ondrej Galbavý, Miroslav Šimek, Veronika Štrbáková: Improving Speech Therapy by Motivational Home Exercises. 2013. Pavol Bielik: Using Wi-Fi Mobility Classification on a Mobile Phone for Energy Efficient Activity Tracking. 2012. Jozef Gáborík, Matej Leško, Jakub Mačina, Jozef Staňo: Sitting Posture Quality Evaluation Using Depth Camera. Terézia Kazičková: Knowledge Sharing by Means of Graph-based Diagrams on Web. 2014. Andrea Šteňová: Feedback Acquisition in Web-based Learning. 2012. Viktória Lovasová: Recommendation Based on Parallel Browsing. 2014. Matej Minárik, Martin Tamajka, Juraj Slavíček, Filip Mikle: Low-Cost Acquisition of 3D Interior Models for Online Browsing. 2014. Jozef Harinek: Extracting Keywords from Educational Content. 2013. Michal Kompan: User’s Satisfaction Modeling in Personalized Recommendations. 2013. Ivan Srba: A Study on Influence of Students’ Personal Characteristics on Collaborative Learning. 2013. Jakub Šimko: Crowdsourcing in the Class. 2013. Jakub Kříž: Keyword Extraction Based on Implicit Feedback. 2012. Martin Lipták: Using Trainable Duplicate Detection for Automated Public Data Refining. 2012. Karol Rástočný: Maintenance of Knowledge Tags in Heterogeneous Web Content: The Repository. 2012. Jakub Šimko: Exploiting of Motivation and Player-Specific Expertises in Image Annotation. 2012. Marián Šimko: Hybrid Approach to Automated Domain Model Creation for Adaptive Social Learning System. 2011. Jakub Šimko: Web Revisitation Support: Graphs and Semantics. 2010. Marián Šimko: Improving Search Results Leveraging Shallow Semantics of Metadata. 2009. Martin Labaj: Users’ Web Browsing Behaviour Inside and Outside a TEL System. 2014. Jakub Kříž: Extracting Contextual Metadata in Programming Domain. 2014. Martin Labaj: Recommendation and Collaboration Based on Implicit Feedback in Web-Based Learning. 2011. Dušan Zeleník: Representing Similarity for News Recommending. 2010. Katarína Kostková: Identifying an Individual in Large Information Spaces by Leveraging Social Relationships. 2009. Ján Suchal: Reconstructing viral recommendation networks from server logs. 2009. Oto Vozár: Adaptive Test Question Selection in the Context of Web-Based Learning System. 2008. Peter Vojtek: Improving Text Categorization Based on Markov Models. 2007. Michal Barla: Estimation of User Characteristics using Rule-based Analysis of User Logs. 2007. Jakub Šimko: FeNa: Battery-Saving, Crowded-Space Navigation and Person Localization System. 1st Place. 2011. Michal Holub: Collective Customer – Shopping Decision Support. 2nd Place. 2011. Dušan Zeleník, Jakub Šimko: Urban Guardian: Clean Streets through Anomaly Detection in Video Stream. 1st Place. 2011. Martin Labaj: YouEHelp – Distributed Participatory Emergency Aid. 2nd Place. 2011. Michal Kompan: Volunteers Activities Support. 3rd Place. 2011.